The finished spider measures only 1" wide x 3/4" high when stitched on 14ct aida. The finished ornament is about 1-3/4" in diameter. This pattern looks cute on a gift tag, greeting card or other small project, just as well as an ornament. Since the chart is so simple, you can even cross stitch this design with yarn over a knit sweater or blanket to add a touch of Halloween. There are no half stitches, and since a single color is used - it stitches up really quickly! The ornament shown was made by taking my little spider chart and stitching it on some plastic canvas, adding red beads for eyes. 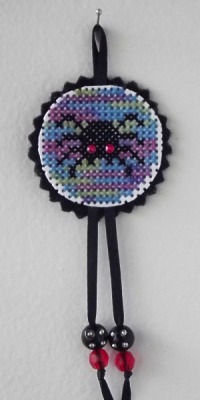 I then stitched with variegated floss to fill in a circle shape around the spider. I backed the stitched piece with felt and pinked around the edge. Then I added a ribbon and some beads to finish off the ornament. Project may be completed all in 1 day!